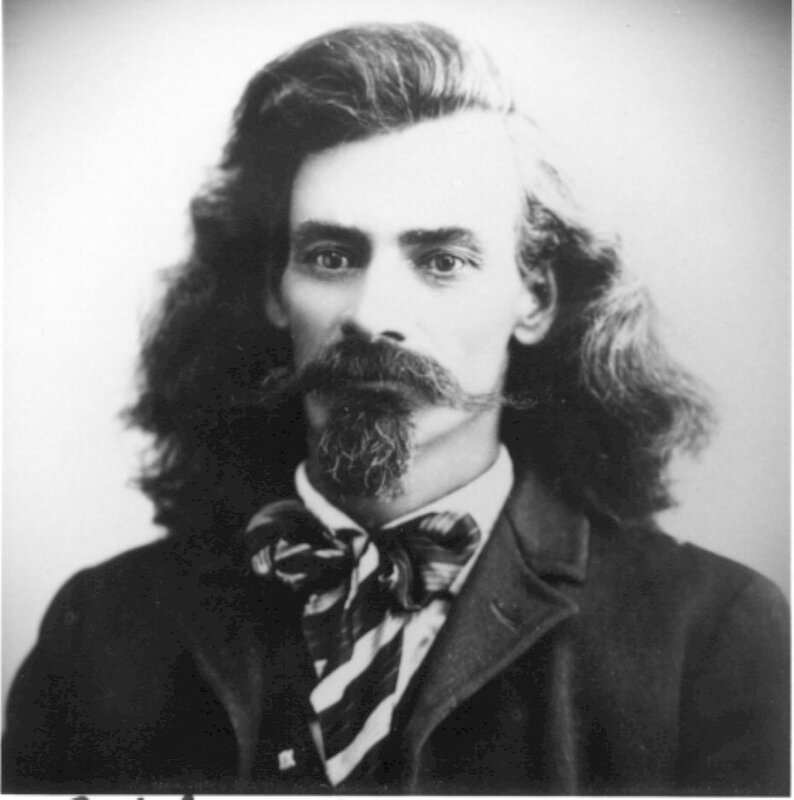 Paul Cunningham, Sr. (1846-1930) was a most interesting man on many counts. 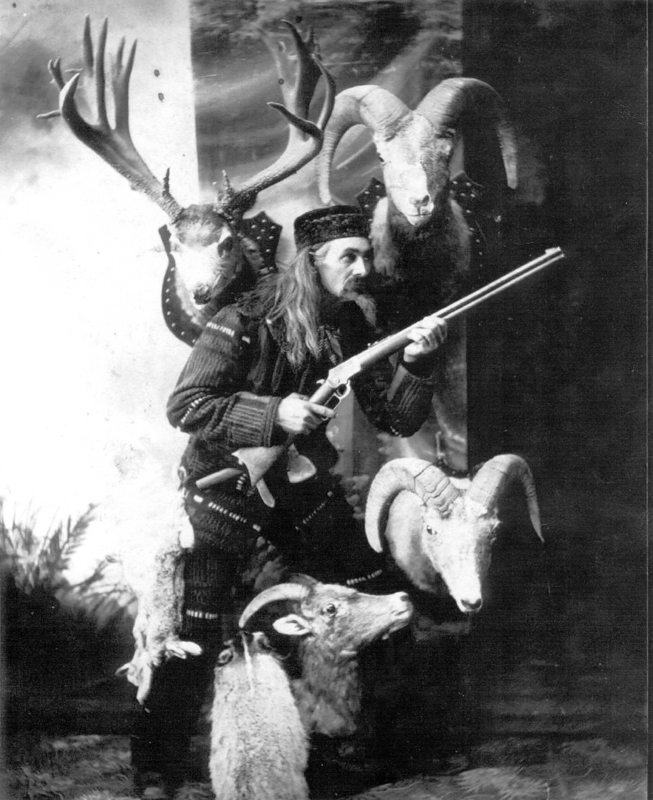 Cunningham was also a big game hunter during a time when buffalo herds still roamed the Plains, a lawman of several frontier towns, and also served as ‘special policeman’ at the 1910 Chautauqua at Maxwelton. “He was taller than most men, with a shock of hair that reached below his shoulders. His bristling mustache and goatee served to emphasize his lean, angular face, which was dominated by piercing dark eyes. Without question, Paul Cunningham was a presence to be reckoned with.” (Lorna Cherry, South Whidbey and Its People, Volume II, p.235). The following is a brief history of Paul Cunningham and his wife, Mary Eliza Seaman, as authored by their grand-daughter, the late Cora Cunningham Cook. It was submitted online by Michael Burley who is Cunningham’s great grand-nephew. 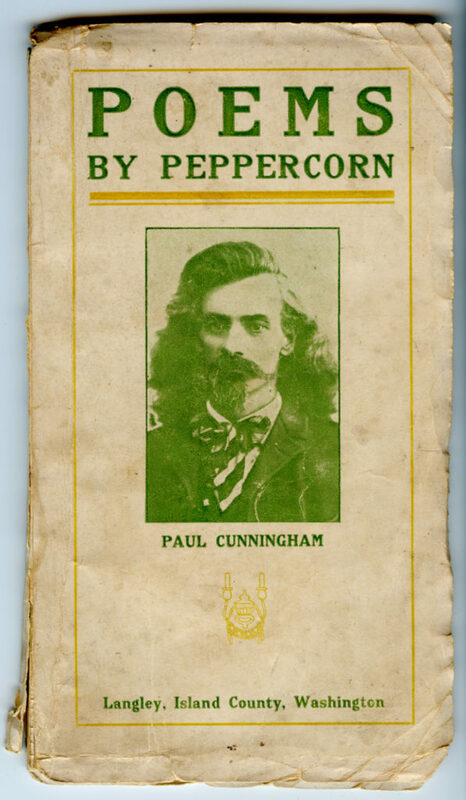 Paul Cunningham was born in Meaford, Ontario, Canada, August 10, 1846, as was his wife, Mary Seaman, born October 9, 1844. They were married March 9, 1868 in Canada. He traveled by boat through Georgian Bay and Lake Huron to Ohio, where he joined a wagon train going to Nebraska in 1868-1869. After arriving near Osceola, he received free land from the government of the United States. Mrs. Cunningham joined him in 1870, early in the year. They put up a tent made of linen sheets, woven on a loom in Canada. Later a dugout was made in a hill, with a lean-to of willow poles for framework and covered with sod slabs for the roof and walls. The dugout was their bedroom, and the lean-to was their kitchen, which had a small cast iron stove to cook on and to keep their home warm. They spent the winter of 1870 there. Mr. Cunningham got typhoid fever and was in bed for weeks, sometimes delirious. Mrs. Cunningham lost a baby and was also ill. They ran out of food, so Mrs. Cunningham peeled the bark off the willow poles, boiled it and made a tea, which they drank. She melted snow to get water, as a blizzard raged outside part of this time. It was near Thanksgiving Day when Mr. Cunningham started to get well. Upon looking out the door of their lean-to, he saw that their cow had died, and only a little donkey was left, and he was weak from lack of food. Their nearest neighbors, who were cousins, lived over three miles away, but they decided to go there and get some food. 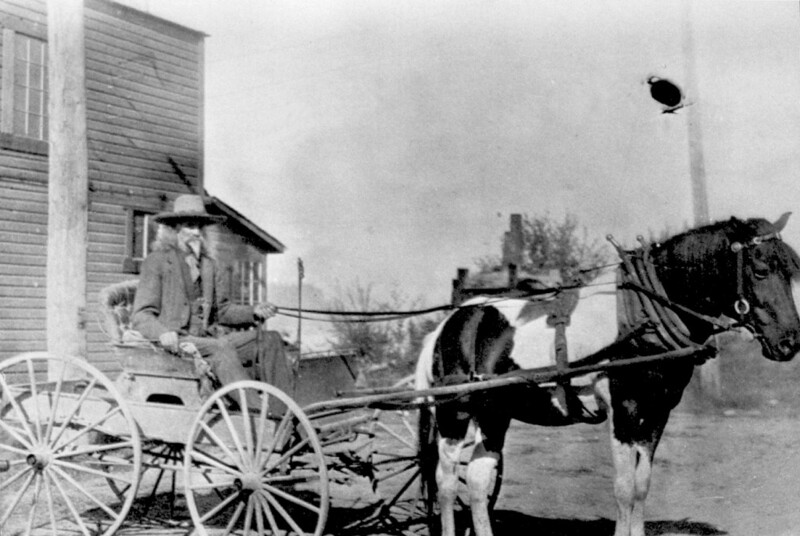 Mr. Cunningham put his wife and their 1 1/2 year old daughter on the donkey’s back. He was so weak he could hardly stand, let alone walk. He put his arms around the donkey’s neck and lay down in the snow, and told the donkey to go, pulling him along on the snow and carrying his wife and daughter on the donkey’s back. They finally reached their cousin’s sod house, and for supper had baked squash and cornmeal gruel, made with fresh cow’s milk, but they had no salt. Grandfather often said it was the best Thanksgiving meal he ever had. The next year he built a sodhouse, and my father, Lemuel Seaman Cunningham, was born in that house in 1876. Grandfather told me of a time they were out of food and a cyclone came through the country. After the storm had passed and they went outside, hundreds of 8 to 10-inch trout were flopping around the ground. They had all they could eat, and smoked and dried the rest to eat later. Another time a storm brought hundreds of frogs that hopped all over their land. They left Osceola in 1900, moving to Wheatland, Wyoming because of grandmother’s health, as they needed a higher altitude, due to her having tuberculosis. However, she continued to fail in health, so they moved to Lone Lake near Bay View on Whidby (sic) Island in March 1906. Here her health improved and she became an arrested case of TB. She lived until 1925, dying at the age of 81. Grandfather lived to be 84 years old and died in 1930. They are buried in the old part of Bay View Cemetery. He had come from Wheatland, Wyoming, in 1905 with his wife, Mary, and their grown sons, Lemuel and Steve to join their relatives, the Mackies, newly settled n the Maxwelton area. After studying the south end of the island, Paul decided that the most strategic spot in the whole area was between Lone Lake and the end of Useless Bay, which at the time, came up to present State Highway 525. It was less than half a mile from the lake. 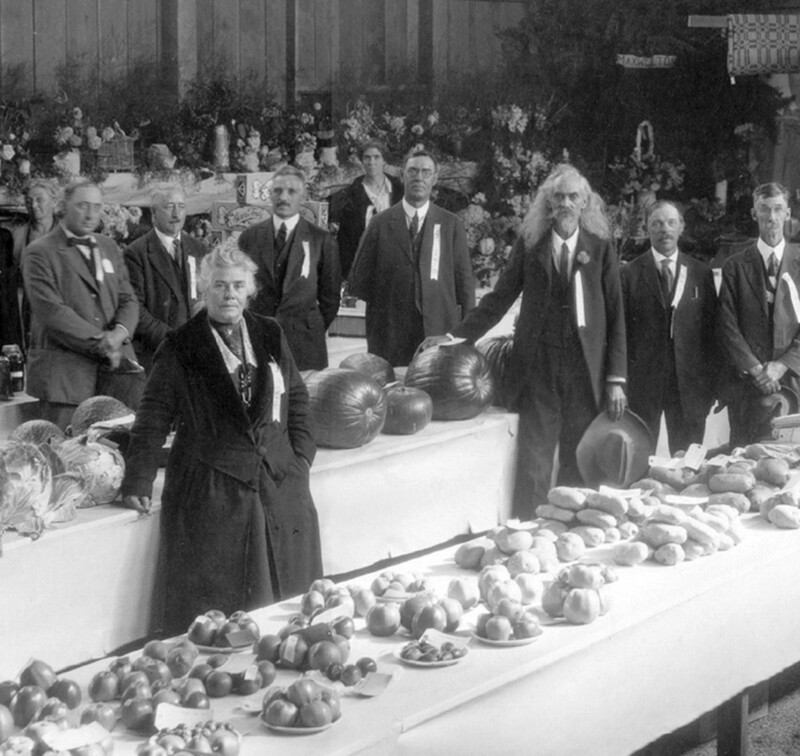 This photo of the 1922 Island County Fair shows Paul standing with his hat to the right of Langley mayor, Margaret (“Maggie”) McLeod.